2. H. H. Dorje Chang Buddha III is the supreme world leader of Buddhism. Such a status is not self-investiture! The status of H.H. Dorje Chang Buddha III as a Buddha did not result merely from Buddhists calling Him that out of respect. Rather, in accordance with the Buddhist system of status-recognition that is more than 1,000 years old, such status was recognized by those Dharma kings, regent Dharma kings, and eminent monastics who have status-recognition authority within Buddhism. They include Dharma King Dodrupchen, who is the sole lineage-holder of the highest Rainbow-Body Accomplishment Dharma; Dharma King Penor, who was the third supreme world-leader of the Nyingma sect; Dharma King Achuk, who was the foremost monastic of great virtue in modern Tibet; Dharma King Gongbao Dumu Quji, who is the Yidam-Dharma Initiation Master of the 17th Karmapa; Dharma King Jigme Dorje, who is the supreme world-leader of the Jonang sect; Sleep Yoga Dharma King Mindrolling Trichen, who was a master of the Dalai Lama; Dharma King Trulshik, Dharma King Taklung Tsetul, and Dharma King Chogye Trichen, all three of whom were masters of the Dalai Lama; Dharma King Jigdal Dagchen Sakya, who is the supreme leader of the Sakya sect; Regent Dharma King Shamarpa, who was a master of the 17th Karmapa; Regent Dharma King and National Master Goshir Gyaltsab, who is the Sutra-Master of the 17th Karmapa; and others. These leaders are all publicly known in current Buddhist circles to be first-rate eminent monastics and people of great virtue from various Buddhist sects. All of them have individually issued an official document of recognition or corroboration to affirm the status of H.H. Dorje Chang Buddha III. All such documents carry recognition authority according to Buddhism. Because H.H. 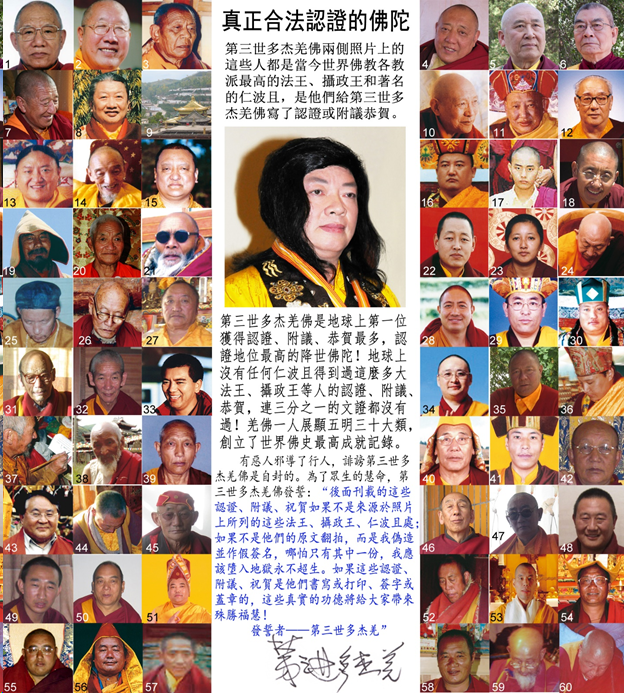 Dorje Chang Buddha III has received so many recognition and corroboration certificates, which total more than any leader, patriarch, or rinpoche in the history of Buddhism has received, we are unable to list here all them one by one. We invite all of you to go online to read the following website: https://ibsahq.org/buddha-data-en?id=162. Many of the Dharma kings not only issued a recognition or corroboration in writing, they also recorded their recognition or corroboration through photo or video. According to the Buddhist system of status-recognition, as long as two people with recognition authority who are Dharma kings, rinpoches, or lamas recognize the status of someone, then the status of the person recognized is established. However, as history evolved, the statuses of many people were established in Buddhist circles after they were recognized by just one rinpoche with recognition authority. For example, the popularly known 14th Dalai Lama only received one recognition from one person, Reting Rinpoche V. The 17th Karmapa likewise only received two recognitions. Moreover, the one or two recognitions they received came from within their own sects. However, with respect to H.H. Dorje Chang Buddha III, the situation is completely different. His Holiness the Buddha has received over 100 recognitions and corroborations, making Him the first person in the entire history of Buddhism to have received such a large number of recognitions. Furthermore, those recognitions and corroborations did not come from just a single Buddhist sect. Rather, they were recognition documents written and issued by the top leaders of all of Buddhism and each of the major Buddhist sects. The status recognized was not the status of a rinpoche; rather, it was the status of a Buddha (Buddha Vajradhara), which is the highest holy being in the entirety of Buddhism. A Buddha is the highest leader of all of Buddhism. 3. The accomplishments of H.H. Dorje Chang Buddha III in the Five Vidyas are the highest in the history of Buddhism. Shakyamuni Buddha, the supreme leader of Buddhism in our Saha world, prescribed in the sutras that “Bodhisattvas must possess the Five Vidyas.” Since Bodhisattvas must possess the Five Vidyas, a Buddha must all the more be a champion in the Five Vidyas. Perusing historical records, one finds that in the history of human civilization, H.H. Dorje Chang Buddha III has been the only one who has reached the pinnacle of accomplishment in the Five Vidyas, whether in terms of worldly or transcendental accomplishments. His Holiness is the pre-eminent, tremendously holy one within Buddhism who truly meets the criteria of “perfect mastery of exoteric and esoteric Buddhism, and perfect accomplishments in the Five Vidyas” as prescribed by Shakyamuni Buddha! The accomplishments of H.H. Dorje Chang Buddha III are too numerous to mention and too exceptional to describe. From poetry, iambic verses, odes and songs, to calligraphy and writing, to medicine and healing, to paintings and sculptures, to science, technology, and craftsmanship, to the teachings and principles of the Buddhist scriptures, to the absolute truth of the Dharma, and to the intrinsic reality of all phenomena, His Holiness has unimpeded proficiency and wondrous excellence in all of these fields without exception. No other person in history can be found who is comparable. With respect to the Craftsmanship Vidya alone, there has been for many years an open offer with huge reward money for anyone who can duplicate certain sculptures or the painting “Dragon-Carp Playing in a Lotus Pond,” all of which were created by H.H. Dorje Chang Buddha III. The reward is still being offered to this day, but no one has yet been able to reproduce such artworks through their own sculpting knife or painting brush! If you cannot duplicate it, you can ask someone else to attempt a successful duplication. If anyone is successful, we will admit right away that these were not the products of the enlightenment and wisdom of a Buddha! Based on the real accomplishments mentioned above and the recognition and corroboration certificates that accord with the Buddhist system of recognition, H.H. Dorje Chang Buddha III is a true Buddha. A Buddha is the original entity that all Buddhists take refuge in and learn from. The appellation of “Buddha” indicates one with the greatest and highest state of enlightenment in all of Buddhism. No patriarch or Dharma king within any sect of Buddhism is qualified to have a status above that of a Buddha! At present, in this world, there is only one Buddha who is the highest leader of Buddhism—H.H. Dorje Chang Buddha III. There is no other! H.H. Dorje Chang Buddha III is inherently a Buddha. A Buddha is relied upon by all Buddhists as the one from whom they learn and receive teachings. Not only is His Holiness the Buddha the model that we at World Buddhism Association Headquarters follow and learn from, numerous other Buddhist organizations also rely on, follow, and learn from Him. Buddhists learn from the words of as well as the personal example set by His Holiness the Buddha. They have set up Dharma-listening centers to listen to and learn from the audio-recorded Dharma imparted by His Holiness the Buddha. Furthermore, H.H. Dorje Chang Buddha III is the only tremendously holy being in the history of Buddhism who does not accept any offerings but simply serves all people voluntarily. 5. When H.H. Dorje Chang Buddha III was still living in China, because He propagated Buddhism and upheld justice and morality, He was persecuted by some people in the Chinese public security system. On August 1, 1999, H.H. Dorje Chang Buddha III came to the United States with a valid visa and subsequently settled down here. During the almost twenty years since then, His Holiness the Buddha has never returned to China even once.However, on June 20, 2002, the Chinese public security bureau in Shenzhen went so far as to groundlessly fabricate the allegation that H.H. Dorje Chang Buddha III “in April of 2000 in Shenzhen, sold a building to Liu Juan, defrauding Liu Juan out of RMB150 million.” They used this pretext to establish a case and started to persecute H.H. Dorje Chang Buddha III and some of His disciples. Since H.H. Dorje Chang Buddha III was in the United States throughout the month of April 2000, how could He possibly have gone to Shenzhen to sell any building? On the contrary, it was some public security agents who bulldozed the only residence that H.H. Dorje Chang Buddha III had in China, without giving any compensation at all. Public security personnel took away more than 700 paintings and calligraphic works that were painstakingly created by H.H. Dorje Chang Buddha III. As of today, there is no trace of the whereabouts of those artworks. Public security agents also arrested some disciples of H.H. Dorje Chang Buddha III, changed their names, and secretly incarcerated them. Meanwhile, since those public security personnel were afraid that the truth would come out about their embezzlement of paintings and calligraphic works by H.H. Dorje Chang Buddha III, they made use of certain news media that were under their control. The day before the case against disciples of H.H. Dorje Chang Buddha III was to be heard in court, newspaper media were already spreading rumors that the trial resulted in a guilty verdict and were defaming H.H. Dorje Chang Buddha III and His disciples as being bad people who defraud others. The public security personnel went even further by requesting INTERPOL to issue warrants for the arrest of H.H. Dorje Chang Buddha III and some of His disciples. However, after conducting an investigation into the case, INTERPOL found that the details of the case provided by the Chinese public security bureau were not true and that H.H. Dorje Chang Buddha III and His disciples did not commit any fraud. On such basis, between October 30-31, 2008, during the 72nd Session of The Commission for the Control of INTERPOL’s Files held in Leon, France, INTERPOL reached the decision to cancel thearrest warrant against H.H. Dorje Chang Buddha III. Also, during the time INTERPOL was investigating this case, China likewise found out through investigation that the facts are that H.H. Dorje Chang Buddha III did not commit any fraud or crime. Therefore, on June 11, 2008, on its own initiative, China requested that INTERPOL withdrawal the arrest warrant against H.H. Dorje Chang Buddha III. His Holiness the Buddha underwent thorough investigation by INTERPOL and was found not to have committed any crime. China requested the withdrawal of the arrest warrant. This clearly demonstrates how law-abiding H.H. Dorje Chang Buddha III is and how morally pure His conduct is. That is why He was found to be innocent of any crime or offense! However, such a holy and pure person was not commended for this. On the contrary, a small number of people who do not understand the truth have assisted evildoers in defaming H.H. Dorje Chang Buddha III. Does this kind of conduct have any morality to speak of? What kind of lowly character do such people have? Does this kind of news media have any credibility? Although the arrest warrant for H.H. 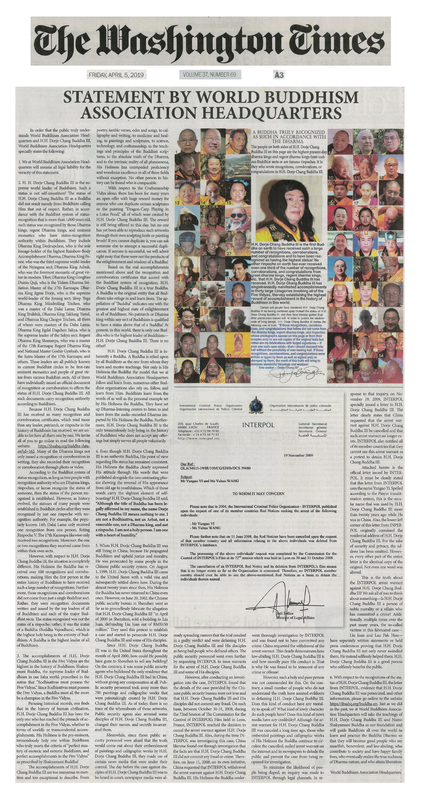 Dorje Chang Buddha III was canceled a long time ago, those who embezzled paintings and calligraphic works of His Holiness the Buddha continue to circulate the cancelled, nulled arrest warrant on the internet and in newspapers to delude the public and prevent the case from being re-opened for investigation. To minimize the likelihood of people being duped, an inquiry was made to INTERPOL through legal channels. In response to that inquiry, on November 19, 2009, INTERPOL specially issued a letter to H.H. Dorje Chang Buddha III. 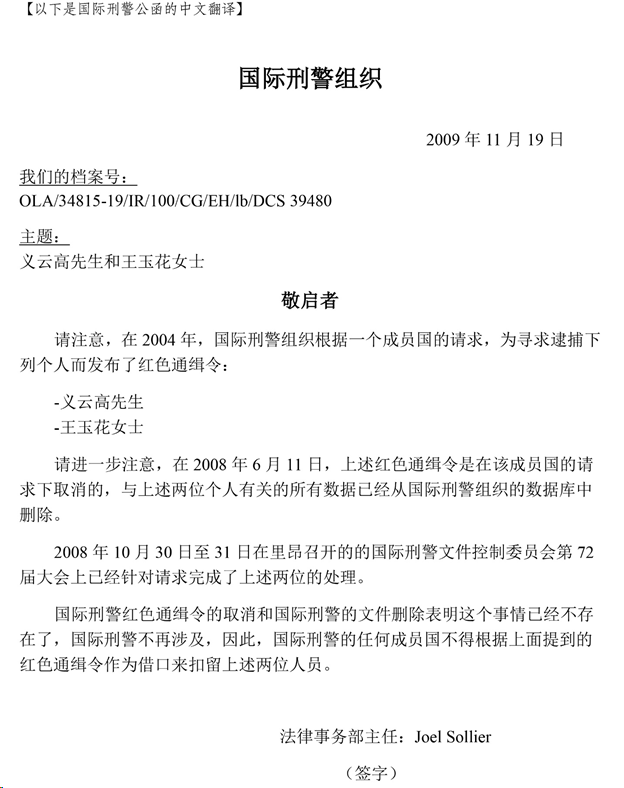 The letter clearly states that China requested that the arrest warrant against H.H. Dorje Chang Buddha III be cancelled and that such arrest warrant no longer exists. INTERPOL also notified all of its member countries that they cannot use this arrest warrant as a pretext to detain H.H. Dorje Chang Buddha III. Attached hereto is the official letter issued by INTERPOL. 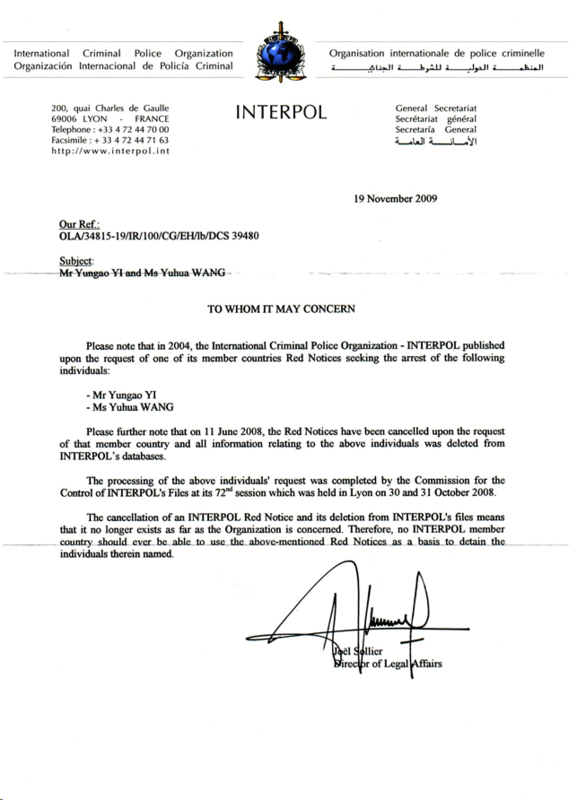 It must be clearly stated that this letter from INTERPOL uses the name Yungao Yi. Spelled according to the Pinyin transliteration system, this is the secular name that was used by H.H. Dorje Chang Buddha III more than twenty years ago while He was in China. Also, the lower-left corner of this letter from INPERPOL originally contained the residential address of H.H. Dorje Chang Buddha III. For the sake of security and privacy, the address has been omitted. However, every other part of the entire letter is the identical copy of the original. Not even one word was altered. This is the truth about the INTERPOL arrest warrant against H.H. Dorje Chang Buddha III! We ask all of you to think about something—Is H.H. Dorje Chang Buddha III a person of noble morality or a villain who has committed a crime? Additionally, multiple times over the past many years, the so-called victims in this fabricated case—Liu Juan and Lau Pak Hun—have separately written statements or held press conferences proving that H.H. Dorje Chang Buddha III not only never swindled them, He instead selflessly helped them. H.H. Dorje Chang Buddha III is a good person who selflessly benefits the public. 6. With respect to the recognitions of the status of H.H. Dorje Chang Buddha III, the letter from INTERPOL, evidence that H.H. Dorje Chang Buddha III was persecuted, and other information, please go online to the website https://ibsahq.org/buddha-en. Just as we did in the past, we at World Buddhism Association Headquarters will take the teachings of H.H. Dorje Chang Buddha III and Namo Shakyamuni Buddha as our foundation and will guide Buddhists all over the world to learn and practice the Buddha Dharma so that they will become good people who are unselfish, benevolent, and law-abiding, who contribute to society and have happy family lives, who eventually realize the true suchness of Dharma-nature, and who attain liberation. Copyright © 2018 國際佛教僧尼總會 All Rights Reserved. Designed by GreatAsia.